The report of this conference, written by Iva Pesa, can be read here. 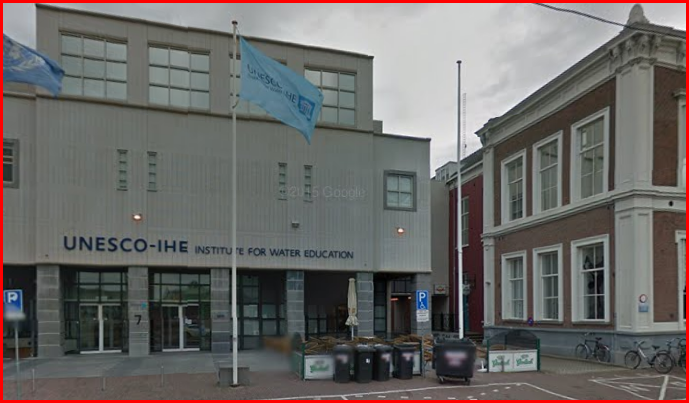 REGISTRATION: to register please send an e-mail to winden@ascleiden.nl . The registration fees are €15 for students and NVAS members, €25 for others. The fee includes a wonderful programme, an African themed lunch, heated discussions, drinks and snacks. What do we know about technology in Africa? Which technologies are being studied, by whom and from what perspective? Which technologies are being developed to make life better in Africa, i.e. easier, safer, or healthier? How intrusive has western technology been? 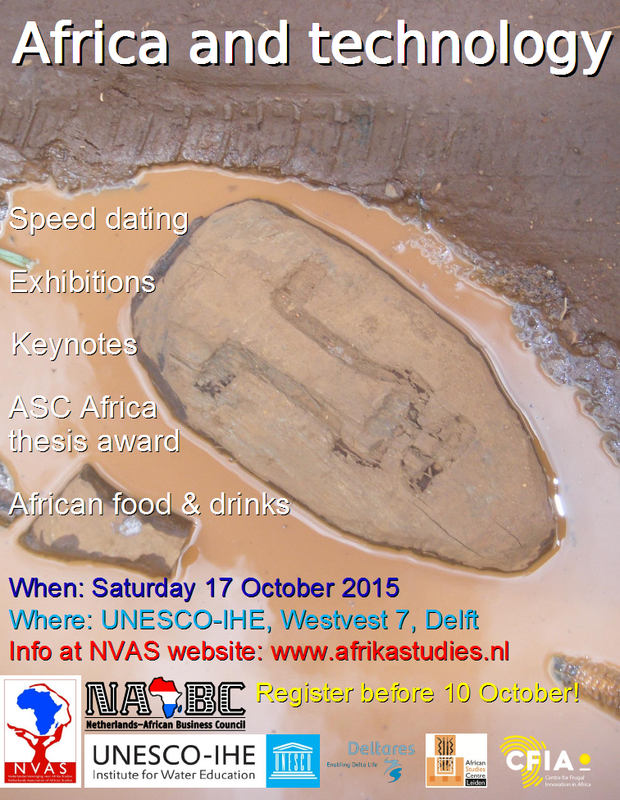 On 17 October 2015 the Netherlands Association of African Studies (NVAS) organizes its NVAS Africa Day to provide a platform for the presentation and discussion of research on technologies that are present in Africa or are aimed at improving life in Africa. Organizers are Pieter van der Zaag and Martin Mulanga (UNESCO-IHE), Anneke Breedveld (breedvelda@yahoo.co.uk) (NVAS), Tom Harmsen and Iva Pesa (i.pesa@ascleiden.nl) (CFIA). The programme is promising! To download the programme please click on the underlined link. Expert researchers present their current research by means of two questions or statements. You can attend four sessions. Feel free to switch rooms between the sessions. allows us to contest the ethnocentric assumptions of the notion of “smart cities”. Blacksmiths, frauds, healers, engineers, IT’ers, musicians, and elderly people constitute the heterogeneous group of technology experts in contemporary Kinshasa. How medical is the medical technology of basic sanitation? How has this technology affected life in African communities? The mobile phone is heavily overrated as ‘tool for development’ in Africa. Are African countries with a (former) repressive regime a good or a bad place to start a citizen-based SMS-monitoring and evaluation system? Game developers are dependent on neoliberal development programs to become successful. Game developers actively use neoliberal development programs to recreate local visions on what it means to be accomplished. Do new ICTs revolutionize political participation, mobilization and engagement in Africa? How have new ICTs influenced Burkina Faso’s path towards political change in the past year? Implementing new techniques in Africa? Use vernacular approaches. Want to become successful with Africa? Consider not one but four returns of investment by using panarchistic business models. What is a possible solution for especially poor people paying too much for water? Is development aid the main reason that the water price in Africa is too high? Can frugal innovation stimulate local economic development in African countries? How can the capacities of low educated traditional smallholder farmers be trained? How can technology be designed to serve these purposes? Despite having lower long term benefits, improved stoves have higher acceptance rates than solar cookers. This is due to the improved stoves being an incremental improvement upon conventional woodstoves, while solar cookers are considered as ‘new’. In order for solar cooker acceptance to increase, we should understand how the solar cooker can be better embedded in existing practices of cooking, selling and gender relations. This will help to reframe the technology as an incremental change.